Stunning locales and amazing skills, fueled by specialized techniques and styles, are the hallmarks of this fast-moving category. Maroon 5 plays "Always You" in this promo for ABC Sports. We understand that sports and music have remarkably similar fan bases, making sporting events the ideal place for both. After breaking records, Fall Out Boy’s “Centuries” has become the anthem of college football, and Maroon 5’s “It Was Always You” now announces to the nation it’s time for Saturday Night Football. The seamless partnership of music and sports makes it clear that opportunities are limitless. Artists want to align with sports platforms when they prepare their releases – ESPN went on to say, could be the birth of a new sports anthem. When you’re ready to take hold of this special time in music and sports, think HABANA. If you’re like most Americans, football rules your fall and winter. And if you’re like most Americans, you tuned in to see our ESPN College Football Playoffs project (with the critically acclaimed band Fall Out Boy) as it crushed all records of viewership in cable television history. Amazing, right? The title game averaged 33.4 million viewers and an 18.2 rating according to Nielsen. It was the largest audience and highest rating in cable TV history. When our Fall Out Boy production first aired, it was during the semifinals. First for the Florida State/Oregon game and then for the Ohio State/Alabama game. The third and final product came later during the College Football Championship game – where Ohio State took home the title. The championship game was a record hit with viewers, as the first-ever college football playoff championship turned in the highest ratings in the history of both ESPN and cable TV. This year’s championship and playoff games all surpassed the previous most-watched cable program – the 2011 BCS Championship between Oregon and Auburn, which attracted 27,316,000 viewers. HABANA President and Founder Steven J. Levy is absolutely addicted to the electrifying space where sports and music meet. With the record shattering success of the Fall Out Boy open, there’s nobody better suited to fuse music and sports than HABANA Avenue. Great music partnerships can take many months — ESPN’s clever music department helps us coordinate with artists so the productions coincide with album releases. The adventure took about two months from start to finish and the post production work went on for about four weeks. By the way – did anyone catch Lolo Pritchard’s powerfully raw cover of Suzanne Vega’s hook from the 1987 hit from “Tom’s Diner”? A special thanks to all of our friends at ESPN in Building 13. We just got back from Los Angeles after a thrilling shoot for ESPN’s coverage of the College Football Playoffs & Championship. We had the killer opportunity to film with the band Fall Out Boy, a critically acclaimed band that has been around for years and still sells multi-platinum records. From the minute we touched-down in LA and started building the set until we flattened tires on the way to LAX – the action was ferocious. After their return from hiatus in 2013, the band is back and hotter than ever. Fall Out Boy just released their new album Centuries – and the song, which is the title track from the band’s forthcoming album, will be featured during playoff games and studio telecasts and during on-air promotions throughout the season. You’ll also hear the song during highlight packages and in & out of commercial breaks during the New Year’s Eve and New Year’s Day bowl game triple-headers. The “New Year’s Six” will showcase the playoff semifinals, four additional premier top-level bowls and the first-ever College Football National Championship on January 12. The song will also be a central part of the regular-season marketing efforts to promote the top college football match-ups across ESPN’s network each week. ESPN began using an instrumental version of “Centuries” on August 25 in advance of the opening weekend. While a preview of the video was released last weekend on ESPN, the full version won’t air until December and won’t play during actual games until January. HABANA recently had the opportunity to film the new ABC Saturday Night Football opening featuring a mid-tempo 80’s-esque electro love song from Maroon 5’s hit new album ‘V‘ titled “It Was Always You.” Like many jobs we work on, it was a tight production schedule – but we nailed it with just a month to prepare and only a few hours to shoot. Unlike the College GameDay opening with Big & Rich, this project had a little bit more glitz and glam. It was shot under the lights and has that primetime energy. Everyone is watching the game regardless of who you’re rooting for because it’s the biggest game of the weekend. This was a unique opportunity to work with artists that are really at their peak – and this was going to be the worldwide release of this new hit track. Helping them execute this while staying on-brand during the release of their album was truly a welcome challenge. The marriage of music and sports is perfect. The artist gets an incredible amount of exposure for their new material and the network is uniquely positioned to be able to take advantage of the music the artist adds to the show, said President and Founder HABANA Avenue Steven J. Levy. We really can’t think of a better way to get viewers to pay attention than to use a hit artist with a new song, releasing it for the first time. Millions and millions of eyes and ears are on the new song for the entire football season – it’s a hit for both the sport and the artist. Luckily, the management team, record label, artists and of course, our production teams worked together flawlessly. Finding a great team doesn’t always happen so easily – especially with big groups and big events. They made it possible for us to shoot and create a beautiful piece. Football season has returned – and we’ve got a big day of sports openers tomorrow! First, watch the spots we shot with Big & Rich on ESPN College GameDay from 9 A.M. - Noon, and later in the evening – an exclusive Maroon 5 video we shot for ESPN will air for ABC Saturday Night Football. This year, ESPN’s college football game telecasts will showcase the music of Maroon 5, Florida Georgia Line and 17 established and acclaimed breakthrough acts from Columbia Records – including Pharrell Williams, Iggy Azalea, T.I., Rita Ora, Jack White and more. Maroon 5’s “It Was Always You” will be the feature song for every Saturday Night Football Presented by Wells Fargo telecast this season. It’ll also used throughout the coverage, including highlight packages, and coming in from, and out of, commercial breaks. 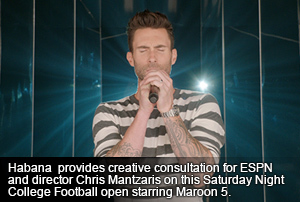 Maroon 5 and ESPN will also collaborate on a video of the song for exclusive use on Saturday Night Football. The video will be a montage of the band performing the song with relevant college football highlights pertaining to each week’s matchup. Saturday Night Football will kickoff tomorrow at 8 p.m. with defending national champion No. 1 Florida State vs. Oklahoma State in the Cowboys Classic from Arlington, Texas. And most likely every word. That Big & Rich song you hear before, during, and after every college football game on ESPN? Shooting the spots surrounding ESPN’s College GameDay is no easy task – it requires a keen understanding of the needs of artist management companies, the personalities of the artists involved, the environment and crowd management of live entertainment, and of course, a thorough understanding of a broadcasting network the size of ESPN. Luckily, Habana happens to love the stuff. The spots for ESPN College GameDay were filmed this year on the expansive re-purposed lawn of a historic Tennessee mansion. Staging a set up that rivals a stadium-sized audience and live music concert is no small feat. Complete with state-of-the-art LED video walls to make the entire stage feel like it was immersed in a football stadium, even we were impressed with the outcome. Athletes and Artists…The Perfect Combination. The worlds of music and sports collide on the cover of ESPN The Magazine. The bi-weekly sports publication teams all-star athletes with music’s MVPs for its annual Music Issue, a trend that continues to gain traction. This cover was published on the heels of our client’s successful partnership Eminem’s “BerZerk” release with College Football highlight coverage. SO nice, they played it twice. In 2011 HABANA was hired to shoot the opening sequence of ESPN’s Saturday Night Football program. The spot featured country music sensation Big & Rich, and highlighted epic college football moments from the past years. The project was ambitious, requiring over 300 extras and an entire set to be designed and built within a week. Finding an exciting concept that would limit time sensitive content was a challenge, but the team was able to create something both high energy and timeless. The consistency of the program turned out to be a tremendous advantage and in 2013, ESPN again decided to run the original Big N Rich spot with updated play action content and college football highlights. Creating something special from a simple idea is always a challenge. However, when a great team comes together and the content is well planned and executed, something truly amazing can be born. The HABANA Avenue team is incredibly proud that this original piece of content has been able to be reused and re-purposed for several years. It truly is a testament to the care and talent given to each and every HABANA Avenue project. We look forward to creating more content that stands the test of time. Yeah, We Shoot Hoops Too! Through the years the College GameDay opening sequence for ESPN’s College Football program has been a cornerstone of the popular broadcast. Hearing the theme song and seeing Big & Rich center stage, marks the beginning of the excitement for many. So, it was no surprise when ESPN called Habana to produce a unique opener for their Basketball College GameDay show. This time, the challenge of creating an amazing show open was compounded by an extremely short production schedule, and a location recently ravaged by the largest recorded storm to ever hit the U.S. east coast, Hurricane Sandy. Habana was left with only 9 days to find a venue, secure local labor and art direct a unique opener. The continued aftermath of Hurricane Sandy left many of the venue options in the North East still without power, fuel, or worse, under mandatory evacuation. In addition, with an incredibly short production schedule, labor was going to need to work overtime. ESPN knew that the grueling schedule and the obvious logistical issues would be a difficult challenge for any production company. They knew that careful pre-planning and precise execution were needed to pull off this project. Special thank you to Director Chris Mantzaris for his creative vision, Rick Paiva and his team for their leadership, and of course, Macklemore for the fresh track. With an expansive oasis of great weather, proximity to abundant production resources and college students, as well as boasting a Bulls team that was in last year’s top ten, the University of South Florida at the Tampa campus was chosen by the HABANA Avenue production team to be the locale for the ESPN College GameDay opener. The show, which is to be hosted by Chris Folwer, Kirk Herbstreit and Lee Corso airing Saturdays starting this Fall, called for an opener with a fresh, high-energy, and youthful vibe. All of these elements along with the phenomenal local mobile staging company, MB Pro Sound & Staging, made Tampa a perfect fit for the shoot. Shot in one of the USF athletic fields, the outdoor fest scene is one of three parts. Other elements will include behind-the-scenes footage of the College GameDay crew and college football clips. “Big & Rich were only available for one day,” recounted HABANA Avenue’s John Mullins, “so we had to shoot within a limited time frame. We needed to shoot at least 1,000 students when the school session was out.” He added that radio calls, a live broadcast, blogs and CraigsList were all utilized to generate a local buzz in order to get enough people to show up.